Pioctures by Sjurlie Photography, model Chantell (B92 – T75 – H105 lenght 1.78m) wears size S.
New collection! 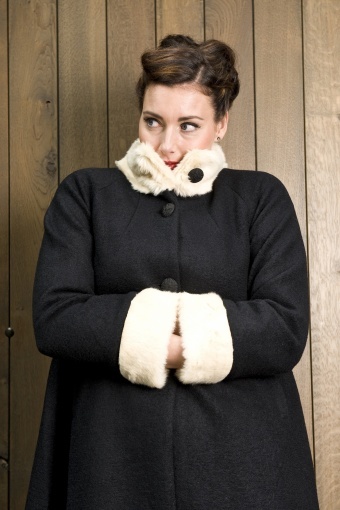 60s Mariella Long Coat Black from Collectif. The new autumn / winter collection of Collectif has its inspiration from the elegant fashion of the late fifties, beginning sixties. 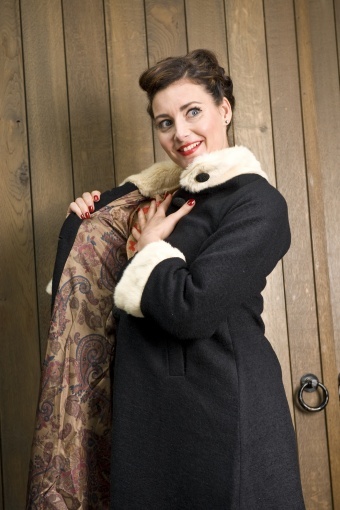 Beautiful fifties inspired A line coat in black made from a fine boucle fabric. Super soft fake fur in creme. The collar can be buttoned up, very comfy in windy weather. Elegant detailing are the handmade buttons. So feminine!